The plummeting value of the dollar hurt OPEC countries. Their oil contracts were priced in U.S. dollars. That meant their revenue fell along with the dollar. The cost of imports that were denominated in other currencies stayed the same or rose. OPEC even considered pricing oil in gold, instead of dollars, to keep revenue from disappearing. For OPEC, the last straw came when the United States supported Israel against Egypt in the Yom Kippur War. On October 19, 1973, Nixon requested $2.2 billion from Congress in emergency military aid for Israel. The Arab members of OPEC responded by halting oil exports to the United States and other Israeli allies. Egypt, Syria, and Israel declared a truce on October 25, 1973. 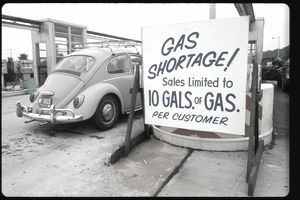 But OPEC continued the embargo until March 1974. By then, oil prices had skyrocketed from $2.90/barrel to $11.65/barrel. The oil embargo aggravated inflation, already at 10 percent for some commodities, by raising oil prices. It came at a vulnerable time for the U.S. economy. Domestic oil producers were running at full tilt. They were unable to produce more oil to make up the slack. Furthermore, U.S. oil production had declined as a percentage of world output.